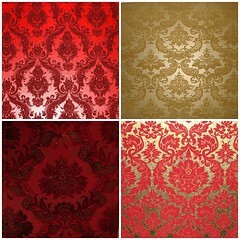 I have a soft spot for intricate, velvety wallpaper. Luckily I get my fix about once a week at the Mel-o-Dee where my knitting group meets. While I was visiting Los Angeles a few months ago, I ran across a crazy bathroom that had 5 different kinds of flocked damask wallpaper, and I took some pictures. Click through and check it out…. Hidden in the patter are skulls, bugs, and woodland animals. it is amazing. Too bad it costs an arm and a leg (also available at Superbuzzy). 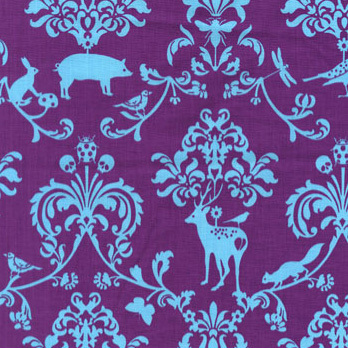 I also found one more Animal damask – this one featuring only rabbits. I would love to have these on my walls! I’ve not seen that particular echino fabric before – way cool! It reminds me of the intricate patterns on the backs of playing cards! My first thought when I saw the picture and first sentence was, ooh, Karrie would love the wallpaper at that bathroom in LA – forgot you were there!! Are you coming back sometime then? I recently saw this effect made with a stencil and silk flocking. They painted some sort of a glue through the stencil and then sprayed the flocking on. It looked pretty cool It was on Changing Rooms (BBC DIY show) so it couldn\’t have cost too much. I bet you could take a pattern from a Dover book, copy it onto a sheet of acetate and project it onto the wall with an overhead projector. A funny about damask: my DH was in a meeting once, in which they were talking about the design of a trade show booth, and some wanted a tone on tone pattern. DH said, “You mean a ‘damask’?” He got a couple of odd looks from the men, and the ladies answered, “Yes! Exactly!” Smart man, he is. I came across the damask wallpaper that you posted .I am looking for fuchsia damask with an antique gold background wallpaper to use for my Wedding invitations! Do you know where I can find this? I found one that I LOVE from Graham & Brown Company, but it has a silver instead of gold background. I love the woodland print and have been trying to restrain myself from spending an insane amount of money on it. I did find a step by step for doing this print as a wall treatment though. Check it out! who makes the rabbit damask i cant find it anywhere and i must find it!?!?!?!?! The bunny fabric is ‘Full Moon Forest’ by Moda. Do you happen to have jpeg or other copy of the complete pattern that would be usable if even as a stencil? All online shops seem to be sold out or unavailable at the present time.